Sixty days, 5 hours, 58 minutes, 2 seconds later and we are finally back to Mississauga. Our journey is over and it was the best decision we have ever made. I would love to continue on and visit other parts of the world where I have never been, because we had such an amazing experience. I am glad to be back though, because I was starting to miss home a bit. However, bringing my sister with me and making her part of the once-a-lifetime-experience turned out to be even better, because honestly I would have been so lonely and don’t think I would have enjoyed it as much. I'm grateful that my family got the chance to experience at least a part of our adventures with us, with the road trip to New Jersey. The best moments come from when we spend time with our loved ones; family, friends, etc... This journey flew by and it felt more or less like it’s been about a year since we left. As St. Augustine said, “The world is a book and those who do not travel read only a page.” Often, many may take life for granted, but after visiting the different places in the world, I realized that it can be a real eye-opener. To travel is not only to discover, but it is really to learn about different ways of living and understand people more. In my planning, there were many obstacles that I had to overcome, such as a lack of money, sleepiness due to time zones, etc. However, after those sixty days, we have found few of the many beautiful mysteries that the world has. 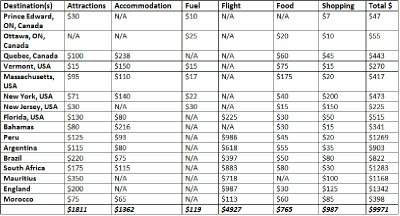 Basically we have made a breakdown of the total spendings we have done while on our trip. Our budget was $10,000 at the beginning and we are so glad to see that we haven't gone over it. One thing about traveling is that different people use different modes of transportation. As for us, we have used; trains, cars, airplanes, boats, bikes and helicopters.We have traveled a total distance of 43467 km or 27010 miles. It is amazing how just yesterday we were in England and now we are back home, in Mississauga. I absolutely loved Old Québec City, since we have traveled to Europe a lot in the past and this place reminds me a lot of that. I also love the fact that Old Quebec still kept the history and they have little shops and streets, instead of everything being together and looking the same. There are many street performers as well! Transforming our vehicle into this may have taken us a while a few days before we have left for our trip, but it was very comfortable and it made our road trip really interesting and fun. This park had a breathtaking scenery and is definetely one of the best places I have been to. I would love to go again sometime. This was absolutely an event not to forget. No wonder it's comes so rarely. I never knew about it until I saw it while in New York City. 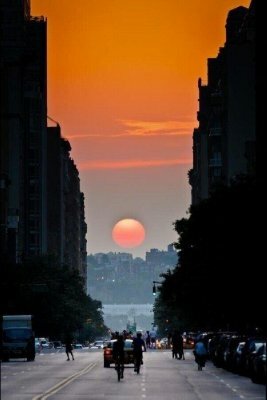 It was pretty cool to see the sun aligned with the street and we were at the right place, at the right time. 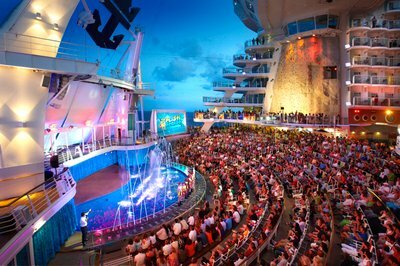 The cruise that took us to the Bahamas was one of the best, as we were able to make so many friends and we were stuck on the boat for so long, so we were only limited to a few things. At the same time, it made me appreciate the few things that I have when I'm stuck somewhere. 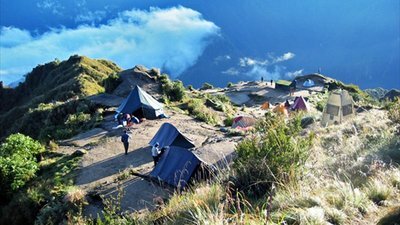 Being able to camp at one of our destinations is something to remember certainly, because everywhere else we mostly stayed at our family members' house or at a hotel in other countries. Also, being able to hike the Inca Trail and go horseback riding in Peru was a great opportunity. El Planetario was our favorite landmark in Buenos Aires, since it is so different from the other attractions and it was also my first time going somewhere such as that. Being able to see the city that you will probably visit only once in a lifetime in a bird's point of view is one thing, but being able to do paragliding to be able to experience that is another. Back in New York City, we got to view the city by helicopter, but once we tried paragliding in Rio de Janeiro, it was a totally different feeling. It felt amazing and it was my first time ever to do such a thing. I would definitely do that again any day, because I have finally got over my fear of heights now after this. Watching the penguins at Boulders Beach was my favorite destination, because who would have ever thought that I could have done that without having to go to Antarctica? I love penguins, and when I went to Boulders Beach, it made me want to go to Antarctica more! I really hope that in the future I'll be able to say that I have visited every continent in the world. I also enjoyed walking along the V&A Waterfront. 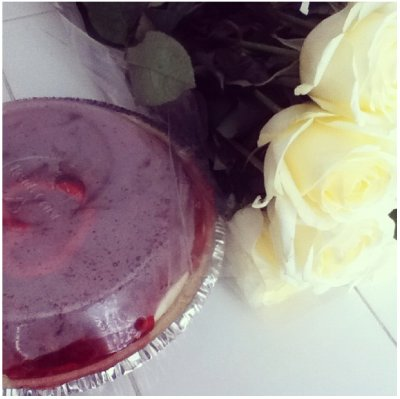 Trying something new every day and you will become more adventurous and you will dare to try more. It will also help you appreciate and have a lot of fun in life. 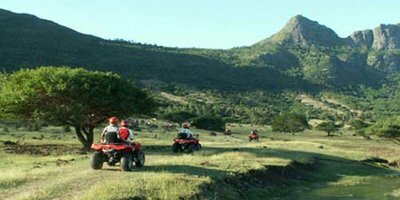 Quad biking in Mauritius while going through the safari was one of those times that made us more of a daredevil, because we were interacting with the wildlife and we were just enjoying nature! Not only did I love the Moroccan architecture which this palace holds, but it was typically Moroccan so that's what I loved most about it. We went to see The Lion King Musical in London. 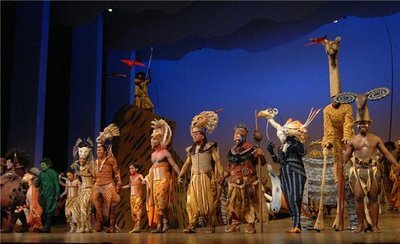 It was my favorite show that I went to see, because The Lion King is one of my favorite Disney movies! 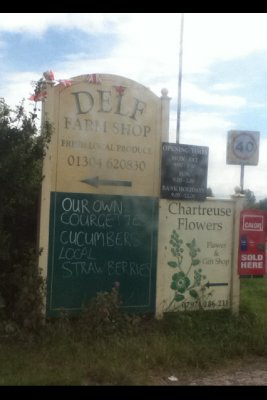 This farm and deli shop had a cake that was probably one of the tastiest I had ever eaten. Unfortunately we were able to only buy it whenever it was available. This is not commercial at all like the other things and we were lucky to have been able to bring some home with us, because we don't know when we can go back to Kent to get this again. There's a famous saying and I quote "Who lives sees, but who travels sees more" and I only got to realize what this really meant after this little adventure that my sister and I went on. We were able to see many parts of the world that we didn't even know existed or expected to see and we were able to find problems in the world that we didn’t know existed. It takes a lot of commitment, dedication and time to travel, but every day paid off for us, even if we may had some bad days along the way. What can I say though? 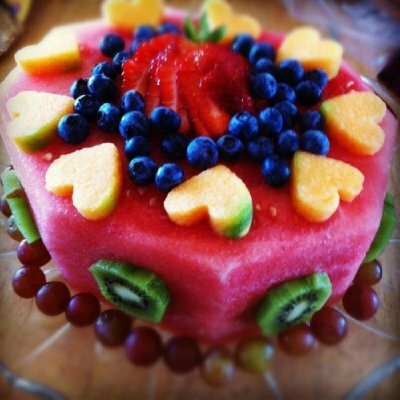 You can’t have a sweet without a bit of sour. There's also the rainbow that appears after it rains, right? So yeah. Sometimes it seems like it’s a lot of money and you don't think you would be able to do it, but thinking about that now, I am getting something back from every moment and every money spent- I still have the memories, experiences, friends, etc that I made along the way on this journey and that will stay with me for the rest of my life. It's sad to say that it had to come to an end. 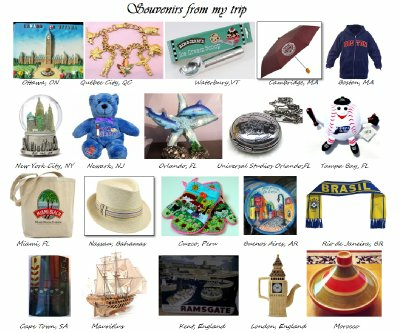 These are only some of my trip highlights and some of my favorite things, but I had many more and I know there is more yet to come. It has been an amazing journey and I thank all of you who sticked with us through it all! 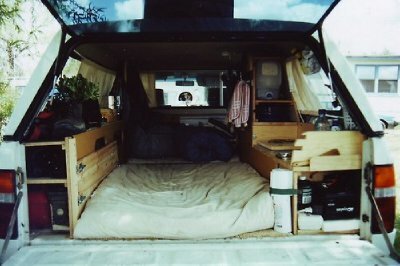 I hope that this blog has inspired you to travel or given you hope that you can do it if you set your mind to it. It has been great and this blog is one of the best keepsakes that will stay with me through this journey that is now in the past. Goodbye, alios, ciao, au revoir. 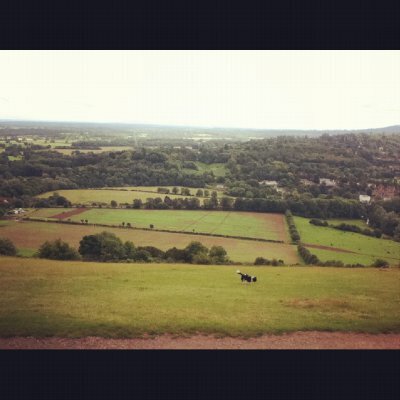 After enjoying the view, sitting down talking, relaxing a lot at Box Hill, we hit the road and left the busy London area/Surrey for Sandwich, Kent. We were actually heading to their house for the few days that we'll be spending here. 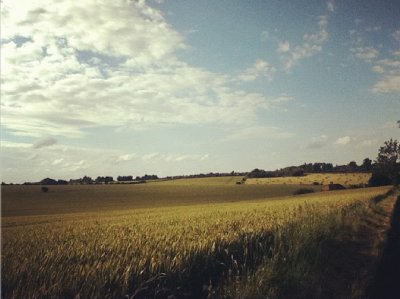 I am also really looking forward to it, because we haven't really been on the countryside that much yet. Traffic and the highways or roads in general in England are terrible, so it took us about 2 hours before we arrived at the farm near their house. 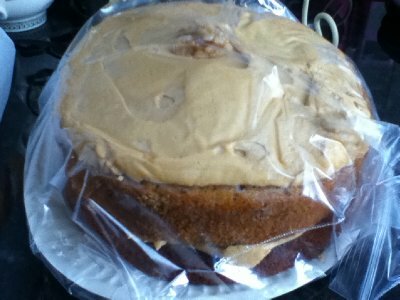 There, we bought one of the tastiest cake I have ever tasted and the best thing was that it was homemade from the people of that farm! It was a walnut cake. We then headed to their house for some afternoon tea. We then relaxed a bit, and got the chance to talk to our parents from back home before they head to work. The girls, my sister and I played some board games after they showed us around the house. It was heartbreaking to hear that their son had died about 16 years back in his room. He had cancer and it was around the time when my dad came to visit them. In Kent, we were staying in Sandwich. 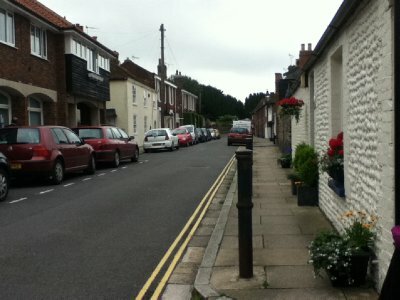 It is the actually the town from which the own company, they sometimes get called in. They own two nursing homes in Kent. They asked us if we wanted to come along and they would show us around one of the houses. So we went. It was pretty nice out too, so we were glad and we were also excited to see how it would turn out, since it is something a bit different. I wonder how it would be like to have your own company and being able to be your own boss! Then we headed back to the farm life. We spent some time horseback riding and gardening. 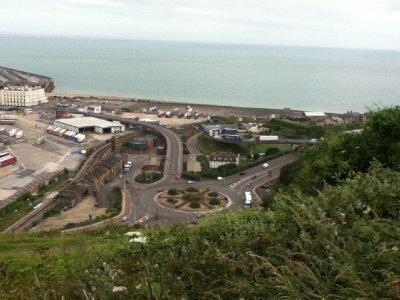 Our other days in Sandwich, we spent it sightseeing at other little towns nearby, such as Dover, where we got to see the White Cliffs of Dover, the Dover Castle, etc. 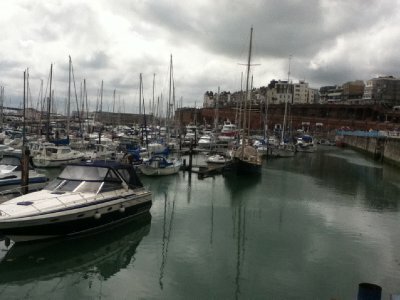 From Dover, there were ferry rides to go to Calais, France. Basically with or without your car, you're allowed to board and spend a day or so in France. Unfortunate for us though, we had left our passport back at the apartment in London, so we were not able to go. 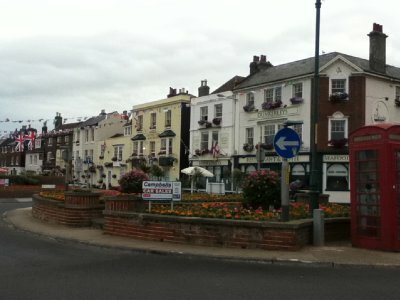 What I also noticed in England is that there are many roundabouts everywhere and I hate them. 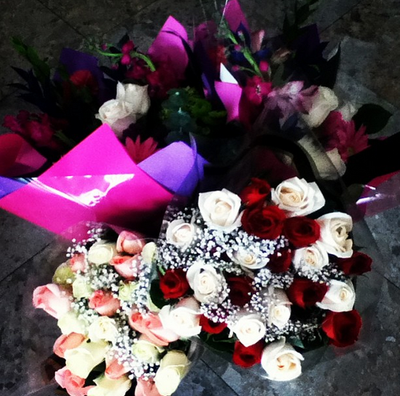 To me, they look really confusing, but I don't know. Oh well, now we are back in London and that only means one thing; another goodbye here to our friends and also this is another beginning or should I say we're going back to the old routine. But then again, after spending sixty days out of home, I don't think it can be the same again, especially after we learned and experienced so much in such a short time. As much as I will miss being able to travel, I must say - I cannot wait to get home! 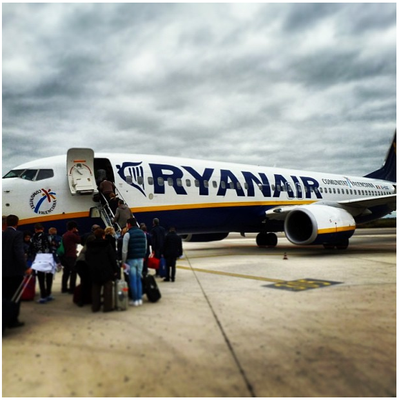 We took a low-cost airline from London Gatwick, a small London airport. Ryan-Air cost us only about 30 pound sterling to come here. If we were to fly from Mauritius directly, it would cost us about $1, 600, so we saved about $1,500. This is our first time going to an arab country and my sister was really looking forward to it. Although language is a huge barrier for me, fortunately she knows enough arabic to help us in any case. She has taken three arabic courses as an elective in University. Marakkech is one of the most famous cities of Morocco. 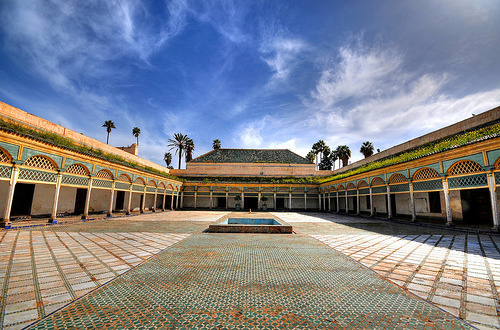 (In fact, the name of the country derived from the imperial cities- so Marrakech, Fez, Rabat, Meknes). 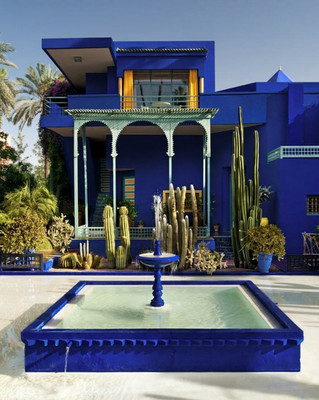 However, Marrakech is also known as either the Pearl of the South or the Red City. The most popular place to stay at while in Morocco is at a riad, which is basically like a hostel or house. The place where we are staying at is called Riad l'Orangeraie. Like all other riads, it has an interior garden. The word riad is actually an arabic world meaning garden. 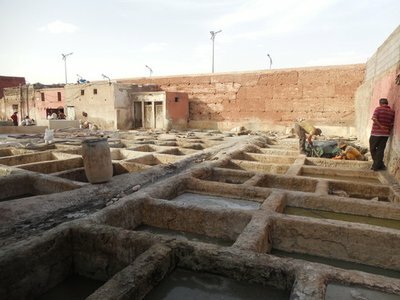 While staying in Morocco, we got the chance to visit a leather tannery. There, we met the girls of the family friend's house where we are going to stay at once we get to England. They were telling about how they were on vacation here, since they have an apartment. So, they told us to come stay over and so we did. 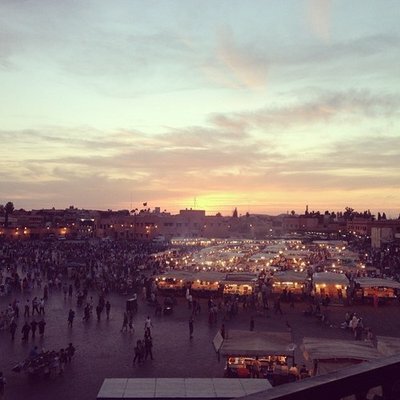 (We only had to pay for one night at the riad, but at least we got the experience of that!) The girls were really lovely and this was our second time meeting them. It took us a long walk to get to the apartment, since in the neighborhood where they live, they only allow people to use donkeys or they have to walk. The girls have been on holidays in Morocco for about a week now and they told us that they're taking the same flight as us, so we got lucky! We didn't know they'd be here, neither did they. 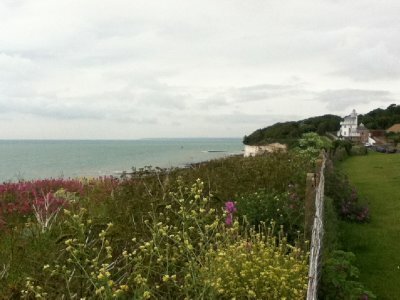 We had just told them we were coming to London, so they offered to bring us to their house in Kent, England. What a coincidence. This is great though, because we're not as lonely anymore! We weren't planning on coming in Western Europe at all, since we were supposed to be visiting only three regions; North America, South America and Africa. However, from Mauritius, the tickets to go straight to Morocco were either expensive (as in not within our budget-from 1,641) or it wasn't offered. But anyway, we have decided to come to England from Mauritius, since we have family here and we could just take a no frills airline to Morocco, our final destination in Africa. As soon as we landed in London at 5:30 am, it was raining out. The atmosphere was quite depressing. 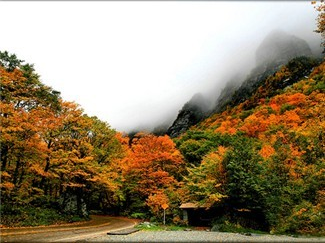 But then again, we learned from our aunt and uncle that in one day, there can be four seasons. We rested a bit when we got to their place at 6 until about 8:30 am. They live in Ilford, about half an hour from the city. We had breakfast, then left to go for some sightseeing. We took the London Golden Tours, where we hopped on the red tour bus and sat at the rooftop. We plugged in the earphones we got and every time we arrived at a landmark, we heard a brief history of it. We decided to first sit and listen to everything before getting off at a certain attraction. It took us about 2 hours for everything. Then, our first stop was the Big Ben. We only took pictures around and then moved on. We took a 30 minute ride on the London Eye, then went to the Tower of London, a boat trip on the River Thames, Westminster Abbey and the Tower Bridge. Since we had the tickets for the tour, we didn't have to pay for the big red buses or the underground tube to go around. We were allowed to get on at any time. But, it was only valid for 24 hours and we were only going to be in London from the 13th to the 15th, so on the second day, we got the opportunity to watch the Changing of the Guards at 11 am at the Buckingham Palace. 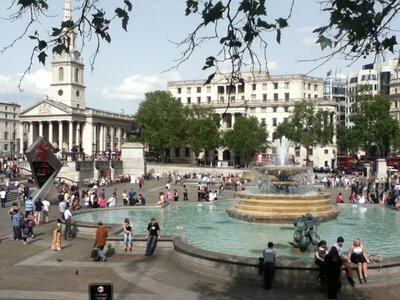 We then spent about half an hour in Trafalgar Square, and then visited the surrounding art galleries and museums, since they are free of charge. We got to go to Tate Modern, the British Museum, and the British Library. 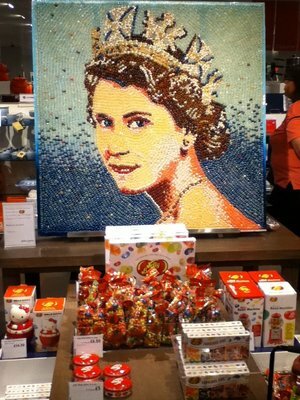 Saw this in John Lewis at Westfield mall, it is made of jellybeans! On our last day, we only spent half the day at Westfield Mall in Stratford. There are two Westfields in London, the other one is Sheppard's Bush. 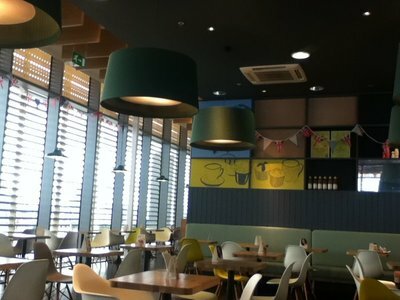 Although it is much more new and nicer, both Westfields were really nice. 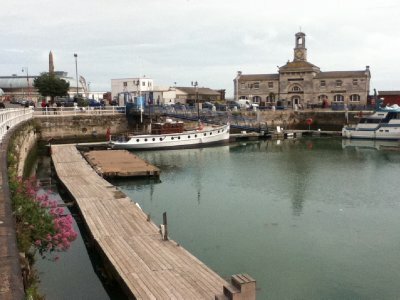 We came to England as a family vacation last year during the summer and that was when we got the chance to visit both of them. 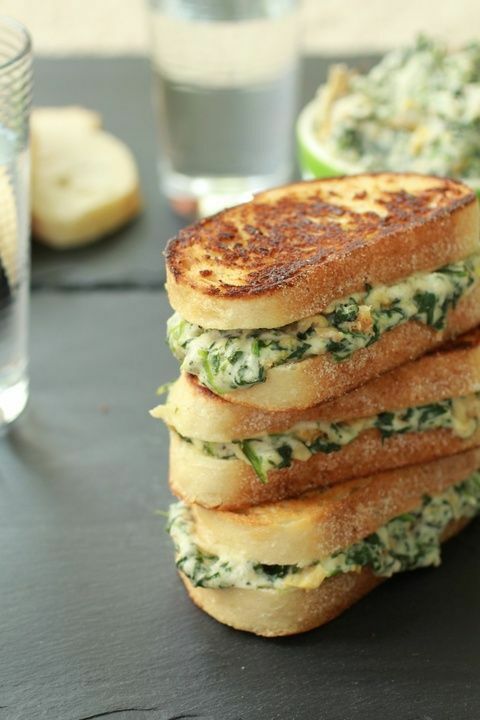 But, as for this time, I think we only have time for one! Oh well. 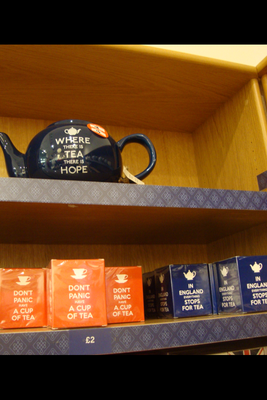 Also while wandering around in Westfield, we stopped at shop and saw this, it was quite funny but it is very true to any tea lovers! One of my favorite shops in London is Marks & Spencer. It is a department store equivalent to JC Penney or Macy's in the USA and The Bay for Canada. They also have a style of coffee shop/restaurant, where they sell different kinds of food, such as lunch, tea, dinner, desserts, etc... And they did have a wonderful afternoon tea! 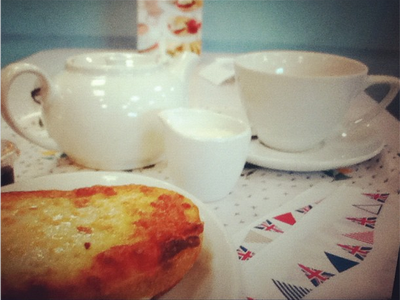 In Canada, most people wouldn't go out for tea at a department store or a very fancy tea shop, let's say. But in the United Kingdom, or maybe I should say in England, they take tea very seriously, so there isn't really a fast-food tea shop like how we have Tim Hortons. 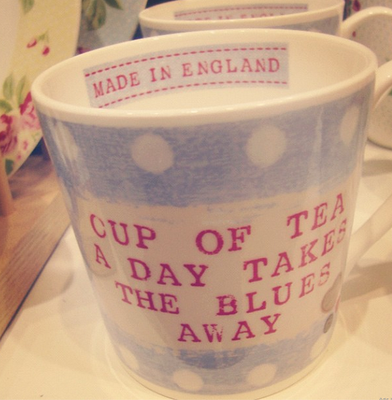 Either way, I love the fact that there is a lot of tea shops everywhere and there is also high class tea, so most of the time, someone would be drinking tea in a nice teacup. 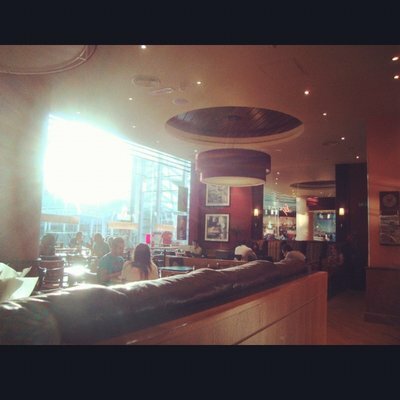 But Costa Coffee could somewhat compare a tiny (just a little bit, I'd say) to Timmy's. Also before leaving for Morocco, we were about to exchange our coins for some dirhams, and then I realized how cool the coins in Britain are! 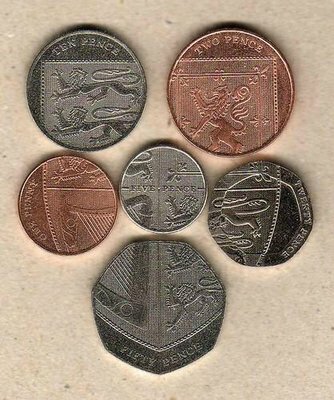 The pound sterlings are put together and they form the British coat of arms- it's epic!